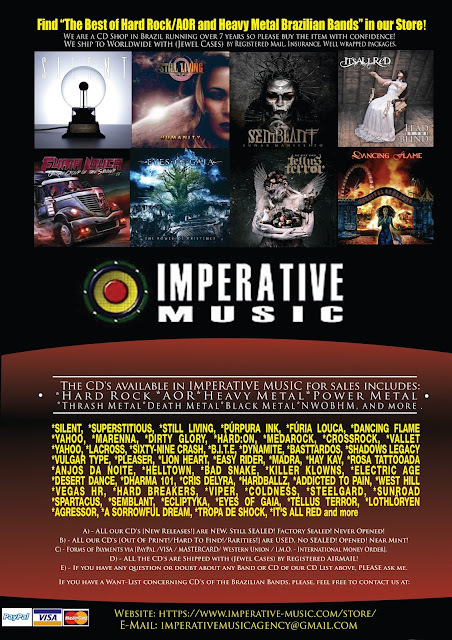 Imperative Music Agency Compilation: First Metal Rock SHOP from Brazil - NEW AND RARE CDs ! First Metal Rock SHOP from Brazil - NEW AND RARE CDs ! We accept Visa, Mastercard, PayPal, etc. Rare, New CDs - Awesome Brazilian Bands you have never heard about, BUT, you will surprise with sound quality them!!! Imperative Music have worked with Record-Labels, Press, Bands, Customers from Europe, USA, Brazil and Japan since 2007 - 100% Honest and Professional. Read the AD and Visit us in our webstore.